What Defines Beauty in the Riding Position? We are well aware that many of our approaches challenge convention and tradition. 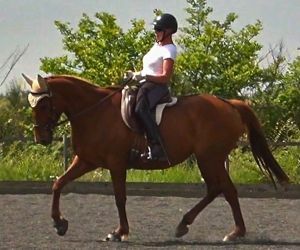 Our understanding of the riding position is one of these, confirmed by the fact that most riders who visit us for tuition remark that our teaching is totally different to any instruction they have received previously. These riders are fortunate enough to feel why this position makes sense and influences the horse in a profoundly positive way, but we know that others judge our riding position purely from its appearance, and some quickly come to the conclusion that it is 'ugly' and 'incorrect', simply because it does not fit in with the conventional riding position. This issue has wide implications, because it touches on what we feel is at the root of the profound disorientation of competitive dressage. It comes down to the error of prioritizing surface appearances above more meaningful inner qualities. Our search for a way of riding that simply feels good, above all else, led us to follow a very purist path in the development of our understanding of riding. Perhaps because our horses were far from talented (and because we weren't prepared to give up on them to 'get a better one'), we longed to find a true solution to the resistance and lack of balance that often made riding - and especially trying to perform dressage movements - an unpleasant and frustrating experience, for both horse and rider. 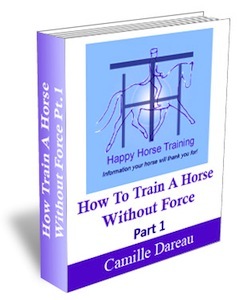 We set out on the long and winding path of studying the rider's pure gymnastic influence on the horse, without giving ourselves any external constraints, such as competitive performance or even imposing fixed training goals on our horses. In the same spirit, we never put our focus on the appearance of our riding position, but only on its function - i.e. how it affects the horse gymnastically, with the functional goal being greater balance, unity of horse and rider, and suppleness of the movement. The weight is dropped into the back of the seatbones, with a tucked pelvis (very different from the traditional 'three-point seat' which involves weighting the front of the pelvis). The lumbar back is stretched flatter than the neutral curve of the human spine, in contrast to the arched, hollow lumbar back accepted in conventional dressage riding. The upper body is kept behind the seat - in collected work the rider may come towards the vertical with the upper body/seat alignment, but NEVER in front of the vertical, and in more lengthened work the shoulders may come well back behind the seat, allowing the pelvis to remain fully connected to the movement. The leg is well flexed at the knee and ankle joints, and is stretched back underneath the rider's seat. 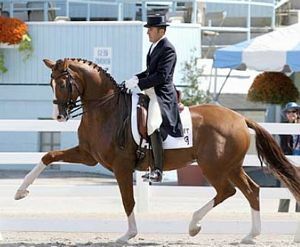 This leg position is quite different from the loose, long-stirruped dressage leg, that is mostly hanging disconnected from the horse's sides, or prodding with the spurs. 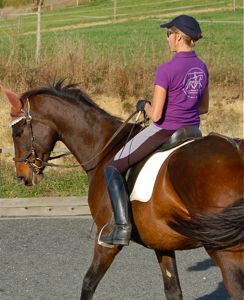 The elbows remain connected to the riders body instead of moving independently, so that the rein contact is unified with the horse's postural engagement via the rider's seat. The rein contact appears less consistent that when the hands follow the horse's mouth, but in this way it avoids becoming a fulcrum of balance, and remains a true reflection of the transmission of energy through the horse's body. Left: The position that promotes postural engagement in the horse without holding in the rein. Below, the conventional riding position that creates the superficial 'look' sought after in competition, but which depends on the use of strong bits and spurs. When we make such a comparison based on the INNER quality of postural engagement, we are looking beyond the outer appearances. It is therefore not important that there is a vast difference in the natural talent and build of these two horses - we must learn to look beyond such characteristics to recognise true gymnastic values. The riding position we promote is all about creating a profound connection between the horse's and rider's bodies, and applying postural engagement to this connection in order to channel the movement into balance. Strangely, it seems to be this very connectedness that some find unattractive. 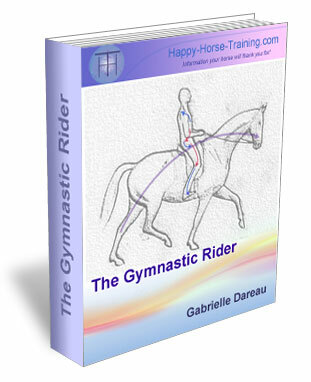 People think it looks heavy or even lazy, due to the centre of gravity of the rider being lowered towards that of the horse, but this is the only way we can achieve gymnastic unity in riding. It may also seem like the seat moves more in his way of riding, but this is because it is actually engaging with the flow of the horse's movement, instead of propping against it. It is an interesting thought on this subject, that separation and independence always seem to appeal to the ego - perhaps a reason why the look of a horse and rider who are profoundly gymnastically connected is distasteful to the part of human nature that loves glitz and glamour. Part of the difference is also that this kind of connection is based on relaxation, not tension and anticipation. Others object to the upper body leaning too far back in our riding position. Again, this is a pure function of the postural alignment of the rider that influences the horse in the most positive way. When riding more lengthened work in trot and canter, the upper body must come back enough to allow the pelvis to follow the full cycle of the stride engaging with the increased horizontal propulsion. The only way to sit lengthened work with an upright posture is to hold on with the reins and use aggressive leg aiding to drive the horse forwards against the backwards-pointing seatbones. 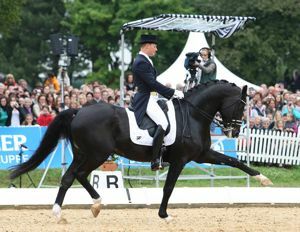 This is an important point: that the riding position we have developed is adapted for riding without a fulcrum of balance in the rein contact, which is not commonly the case in dressage. As soon as the rider has the support of a holding rein contact, everything changes in terms of the postural demands on their body, and there is a lot more leeway to assume a superficial position that conforms to certain aesthetic criteria. The subject of how we define the aesthetics of the riding position brings up the question of which criteria we use to define beauty in general. It is common for us to conform to predetermined aesthetic opinion in defining what is beautiful, and although we may be under the impression the these are absolute values, often they are simply a reflection of visual conditioning through some form of sovial convention, be it tradition or current fashion. For example, the notion of what defines beauty in the female form has changed enormously in the course of the last few centuries, from the most voluptuous physique being considered the most visually pleasing, to the near-skeletal being idolized. This shows that our perception of superficial beauty is not absolute, but in fact completely subjective, formed by many cultural factors. when the innate qualities of the materials out of which something is made become its beauty, instead of attempting to achieve an appearance with a surface exterior. 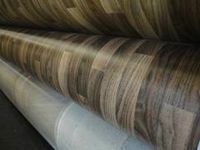 This is shown by comparing beautiful solid-wood flooring (above) to fake wood-effect linoleum (left). This conception of aesthetics is founded on deeper principles of beauty, such as intrinsic physical values of harmony, balance and unity. We can see these principles in action in many sports, where the most skilled performers are often the most elegant e.g. 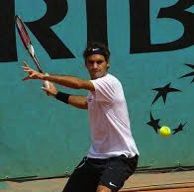 the beautiful swing of a top golfer, and the graceful style of a talented tennis player. The concept of aesthetics being intrinsically connected to function is present in many aspects of music, whose the laws of harmony are absolute. For example, the form of a musical instrument is defined by the sound it must produce, and this shapes its visual beauty. Equally, a talented musician - in no matter what musical domain - has an 'ear' for the fundamental principles of harmony, rhythm and composition, which is used to develop their musical skill, resulting in good music of any kind. Therefore, if we want to define the aesthetics of the riding position based on absolute principles, not just on some arbitrary style, then this position must be formed by its function, which is to bring the horse's movement into balance without constraining it. We should remember that the position that has come to be seen as 'correct' in dressage originates in the classical dressage performed by the nobility of the renaissance period, where horses were dominated by severe bits and spurs, and the idea of what was a 'proper' posture for a person of high social status was very constrained. 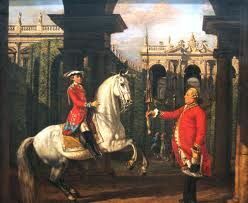 The gymnastic demands of fully engaging with the horse's movement, in order to posturally channel it into balance, were not a priority over the presentation of a certain picture, and, of course, the horse's performance of impressive movements was always the main concern in this aesthetic. Because dressage as a sport has also become defined by aesthetic judgement, it is equally extremely limited to a certain fixed appearance accepted by the judges. Instead of the rider's position being formed by the function of its influence over the horse, it has become constrained to a certain 'look', and people have become used to this look to the point where they see anything different as ugly. Coming from the position of having prioritized the feel of balanced movement in our own riding, we do not see the conventional dressage position of a hollow back, a slack, disengaged leg, and an extended arm that leans on the horse's mouth, as beautiful or correct, because the postural connection with the horse is missing, and the resulting spectacle is a parody of true balance and harmony. In our holistic management of horses, with the goal of making the horse's lifestyle as healthy, happy and stimulating as possible, we have come to value the inner qualities of a horse above the outer appearance. Many sacrifices are necessary in a horse's lifestyle in order to produce a perfect exterior, such as the confinement of a stable, the isolation of living separately from other horses, the metabolic disruption of continual rugging and clipping, and the many damaging effects on the health of a high-carbohydrate diet. As a result of all of this, one may achieve a gleaming, fine and flawless coat, and voluptuous condition, but inside the mind and body are damaged in many ways. Just like with riding, we have to make the choice of what we value more: inner qualities or outer appearances? 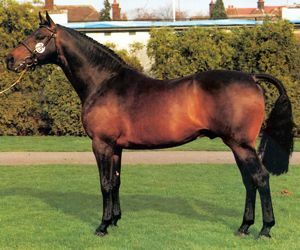 It is easy to make the mistake of thinking that the immaculate appearance of a horse with an artificial lifestyle is a reflection of inner health and happiness, but the many health problems of horses kept in such a way is proof to the contrary - colic, ulcers, hoof disease, lamenesses, arthritic joints, not to mention the psychological damage. 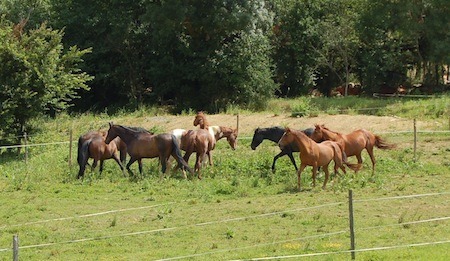 Horses are meant to move, to interact with each other, and to manage their own lives. When we completely remove these possibilities from them, the damage is profound.